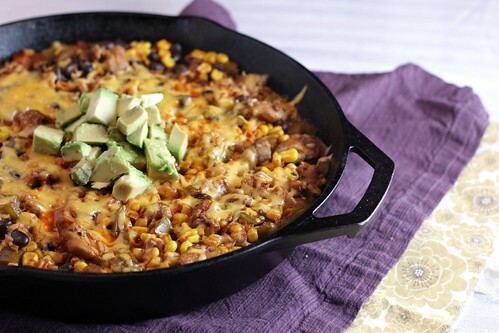 Tex-Mex Chicken & Rice Skillet – Elly Says Opa! I’ve been staring at a blank screen for a while here, because I don’t know how many more times or ways I can tell you that we’re a Tex-Mex loving family and that one-pot meals are highly desirable in our lives right now. This meal is just…us. It’s quick, it’s pretty healthy, it’s got the flavors and ingredients that we love, and it’s comforting (also, it can be served with sour cream). Heat the oil in a large, deep skillet over medium-high heat. Season the chicken with salt, pepper, chili powder, cumin, and oregano. Place the chicken in the skillet and brown on both sides, about 4 minutes total (chicken will not be cooked through). Remove and set aside. Add the onion and green pepper to the skillet and saute until tender. Stir in the garlic until fragrant, followed by the rice. Stir the rice for a minute, toasting the kernels a bit, before adding the broth and enchilada sauce and bringing to a boil. Meanwhile, cut the chicken into bite-sized pieces. 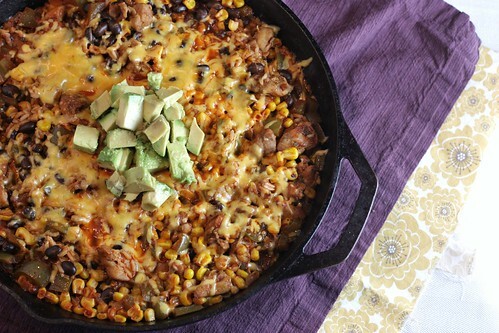 Add the chicken, black beans, and corn to the skillet. Bring to a boil again and then reduce the heat, cover, and simmer until rice is cooked, about 15 minutes. Stir in 1/3 of the cheese, and then top with the remaining cheese. Place a cover on the skillet just until cheese is melted (alternatively, you can stick the whole thing under the broiler for a minute). Serve with your favorite garnishes.